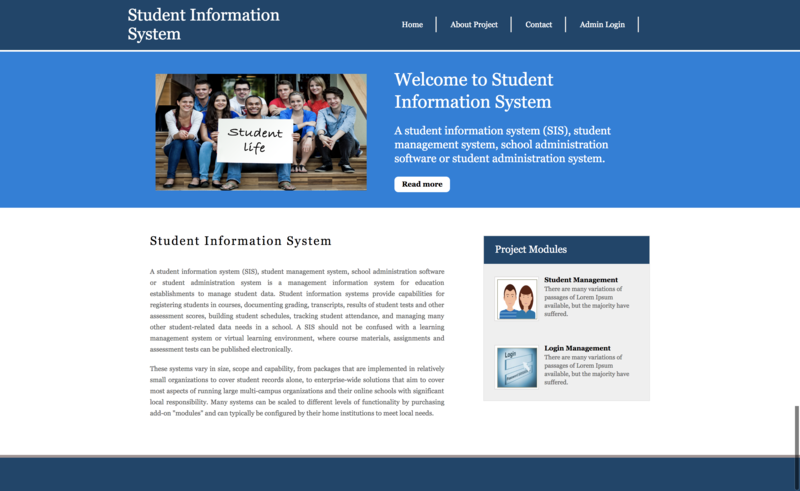 This project Student Information System has been developed on Python, Django and MySQL. We provide full python mini projects with source code and documentation. Here students search easy python projects and get easily download free php projects with source code and database. This Mini Python project Student Information System maintains all the details about students. It track all the personal information about student. There is a single user admin in this mini project and admin can manage all the information related students and after login admin can also edit, delete and update student name details, city, course, class, admission details etc. This is easy python projects which you can easily configure it and learn a lot from these. We will provide academic students full python source code and database of the project. The main aim of this module is provide all the functionality realted to Students. This Student Module is an important module in this mini project Student Information System which has been developed on Python, Django and MySQL. Our website Freeprojectz.com contains free download python applications projects including source code and database. It tracks all the information and details of the Student. We have developed all type of CRUD (Create, Read, Update and Delete) operations of the Students. This is a role based module where admin can perform each and every operations on data but the Student will be able to view only his/her data, so access level restrictions has also been implemented on the project. This is the login form, from where Admin can login into the system. Windows : This project can easily be configured on windows operating system. For running this project on Windows system, you will have to install Python 2.7, PIP, Django.